The decision, largely by the US, to increase forces and raise the profile in Europe facing Russia is a tactical and strategic mistake, and amounts to a small minded approach to a much bigger problem that can lead to tragic mistakes or backfire causing harm in Eastern Europe and fracturing NATO to the point where it ceases to exist. NATO has never been in worse military shape. The Europeans, who have lived off of American military welfare while they grew richer and richer, today are spending a pittance on defense. They lack the tools to do anything serious in military terms: many of them have shed their armor, their air forces are weak, and European naval deployments get thinner and thinner. Britain no longer has even one aircraft carrier, and even if it did, it got rid of any airplanes it had that could fly off such a platform. Some northern European countries, such as Latvia, Estonia and Lithuania, spend almost nothing on defense and their armed forces are incapable of any serious defense of these countries. While NATO may think it has an obligation to defend them, doing so is non trivial because they lack the infrastructure even to support and feed NATO soldiers. But don’t hold your breath: the chance of NATO coming to the aid of these countries in any real confrontation is close to nil. NATO state political leaders will do for them like it has done for Ukraine, that is to say, nothing much except to get them into deeper and deeper trouble. A weak NATO is a liability and a danger. If NATO is not going to be systematically strengthened, trying to claim it is a capable alliance capable of defending Europe is foolish and risky. Nor is there any real prospect Europe will start to invest in its own defense. For the most part, European air forces are shrinking, and land forces are tiny compared to what the Russians can muster. The F-35, when it finally becomes available in 3 to 5 years, won’t help matters. It is so expensive that there will be relatively few planes to confront Russia, assuming the F-35 performs anything near its advertised capabilities. The Russians, meanwhile, are modernizing their forces and have demonstrated the ability to project power efficiently. Their exercise in Syria has to be admired by military experts, notwithstanding political and moral issues. Russian aircraft are state of the art, and Russia has invested heavily in sophisticated electronic jamming systems and countermeasures as well as air defenses such as the S-300. S-400 and emerging S-500 systems. 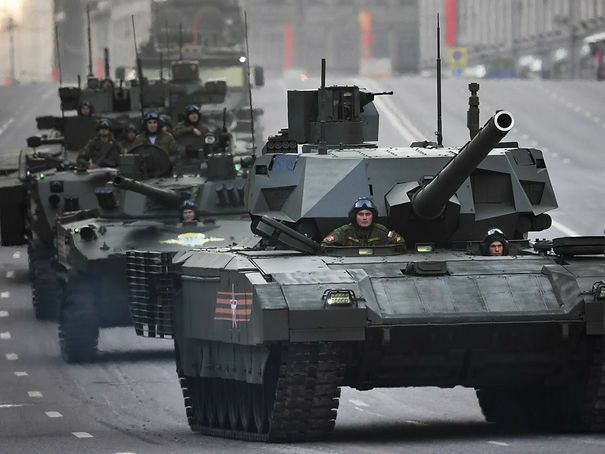 Russian ground forces are also improving, with the introduction of the Armada tank and IFV now getting underway. The main constraint on the Russians is money. They don’t have much, even though Russia is the world’s biggest oil producer. The collapse in oil prices and sanctions because of the Ukraine, has taken its toll on Russia and it clearly affects what is available to spend on armaments. So any real Russian build up is some years away, simple because the money isn’t there. In fact, we don’t really know if the Russians, even under better economic conditions, will do that much to build up their own forces. The Russian economy has only three money makers: oil (including natural gas), grain exports* and arms. Russia clearly wants to build its arms export industry, because it brings in hard currency and underwrites the cost of local defense. Russian arms exports are starting to grow. But a real conflict could collapse the Russian economy, stymie arms exports, and reorient Europe away from being on the far end of Russia’s gas pipelines. It is hard to see this as an outcome that is good for Russia. It is right for Western leaders to worry about threats to the underbelly of NATO –namely the new NATO acquisitions in the North, the Center and the South. But it is not the right time to play a game of provocation escalation. In fact, it makes more sense to try and lower the profile as much as possible, taking into account the elemental weakness of NATO. We also must keep in mind that the deterioration in defense capabilities extends just as certainly to the United States. For the most part, American forces are worn down and our brave troops are worn out. We have not even taken care of what we have, and furtive wars in Iraq and Afghanistan have drained our military and hurt our economy. Investment in new systems is way down, troop numbers have been cut back, and equipment has not been repaired. We can ill afford to act like the big time player we used to be. In short, time to stop the rhetoric and reconsider what is in our best national interest and in the best interest of our allies and friends. Pretensions otherwise can cause a self-fulfilling prophecy that we don’t need. *Grain exports are currently greater than all arms sales from Russia combined. This is a remarkable turnabout for a number of reasons including the absence of Communism and collective farms that destroyed Russia’s grain production capabilities and in spite of the loss of Ukraine, which was Russia’s breadbasket. The Russian state is investing in agriculture modernization including beef and dairy production and setting up export hubs as well. **Stephen Bryen is a defense and security technology expert and ran the Defense Department’s export control program as a Deputy Under Secretary of Defense and as head of the Defense Technology Security Administration. It makes me wonder what would happen if the US had disbanded NATO at the end of the Cold War. Would Europe be forced to grow a pair or would them just roll over and die? It is impossible to speculate. At the end of World War II most of Europe was devastated and the Soviets had taken over Eastern Europe and controlled part of Germany. We sponsored Western Europe’s recovery (i.e., the Marshal Plan), and provided the main resource (with the UK) for European defense. NATO was the answer to Soviet expansionism.